Gone are the days of going to the optician for a prescription of your lenses every six months or one year. It is a novel idea and one that should have been thought of before – self-adjustable lenses to suit the user’s vision power or problems. Adlens empowers the user to control the curvature of the lenses so that the power in the lens increases or decreases according to the need and manipulation of the user. 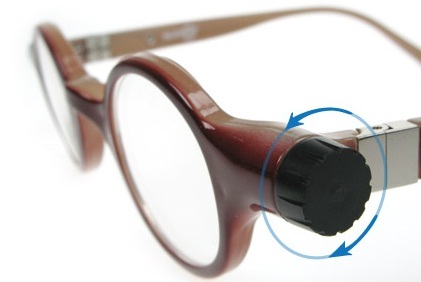 This works through a patented liquid lens technology where turning the dial on the side of the glasses will increase or decrease the flow of the high refractive index liquid into the space between a plastic-like sheet in the lens. This changes the shape of the lenses – the more they curve, the higher is the power of the lenses, and vice-versa. Adlens allows users to vary the power of the lenses they wear according to the situation. It also allows the glasses to be shared among intermittent users. But the bulky Adlens lacks elegance or style and many users who view lenses as a highly visible fashion accessory will balk at the ‘bookworm’ look.